There are many manes that can be put in the "Rocky Horror Legend" category, but none as famous or long lasting as Perre Poley. Perre (pronounced "Perry") has been around forever. 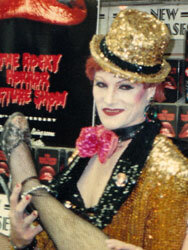 He first went to Rocky Horror in 1979 in a small theater in Linden, New Jersey. He did Riff Raff for about two years until his theater's Frank retired. Perre moved into Frank N. Furter's position, and the legend was born. In 1981, Perre joined the famous 8th Street Cast, and has been with the show ever since. Over the years, Perre has become a Rocky Horror fixture. He has appeared at almost all of the major conventions - most recently at the 20th Anniversary and Megan Tabor's very well done RockyCon '96 - doing his renowned "Tim Curry Tribute", a one man show featuring most of Tim Curry's most popular songs. Perre has also appeared as Frank N. Furter on MTV, VH1, not to mention the various live Rocky Horror shows the New York City Cast (formerly called the 8th Street Cast) does every month. But Perre's talents are not limited only to Rocky Horror. He has appeared as an extra in "Hackers" and "To Wong Fu, Thanks for Everything, Julie Newmar". Perre has also made the talk show circuit, appearing on Rolanda and the Richard Bey Show. Perre is also a professional makeup artist and female impersonator. Perre is currently performing on a semi-regular basis in New York, appearing once every month in his old role and at each love show. But the love of Rocky Horror, and his Rocky Horror friends, is still in his heart, and it's not unusual to hear "Time Warp" or "Sweet T" playing at his house during the late hours of the night, even after all these years. And he's also the first person to stress the importance of his own bit of personal philosophy that he lives by: "Don't dream it, be it!"